Meeting the needs of people with a wide range of disabilities, our boats make sailing accessible for everyone. We have some very special vessels of our own and also regularly charter a wheelchair-friendly powerboat and 35-foot sailing catamaran to broaden the experiences we offer. A Drascombe longboat, Iris is a roomy sailing boat capable of accommodating a large crew of up to seven people. As she doesn’t have a boom to bump heads, she provides a safer sailing experience, particularly for people with slower reflexes, impaired sight and limited mobility. 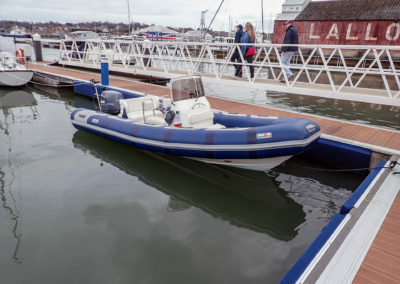 A crucial part of our fleet, Zebedee is a rigid inflatable boat (RIB) that we depend upon to help ensure the safety of our crews and passengers. Capable of high speeds, she comes in very useful for towing in our sailing boats, if the wind unexpectedly – and frustratingly – drops.